“Her Tormentors” 2018 collage, gouache on paper 18" x 24"
Coming of age in the late 70’s in a post Vietnam world I began my art career truly believing that we would never fight a war again thanks to the activism of the 60’s. I was one of the men born between ‘57, and ‘59, who were completely exempt from Selective Service registration. The aerial bombardment of Iraq in 1991 took me by surprise and began, for me, a gradual realization that I was a pivotal player in the cultural/political shift from a draft military to our current all volunteer military. Thus began a desire to evolve my aesthetic to change and take on more relevant content. Much of my work has since gained an activist perspective in order to begin identifying and defining emerging moral calculi. I grew up in a suburban “development” in Poughkeepsie, New York 100 miles north of NYC. After winning the Charles Burchfield Scholarship for Art I attended Pratt Institute in Brooklyn in 1976. Upon graduation I found myself confronted with a burgeoning Neo-expressionist art scene in New York City’s East Village and much of the artistic activity was played out as artist organized shows in various nightclubs and alternative spaces. My work thus adopted an edgy, graphic, second-wave graffiti sensibility, while still attempting to resolve issues of boundary, structure and device in relation to easel painting. In 1994 I moved to Maine with my wife and two children. I joined the Union of Maine Visual Artists in 1995 and served on the board of Directors of Waterfall Arts from 1999 to 2009. 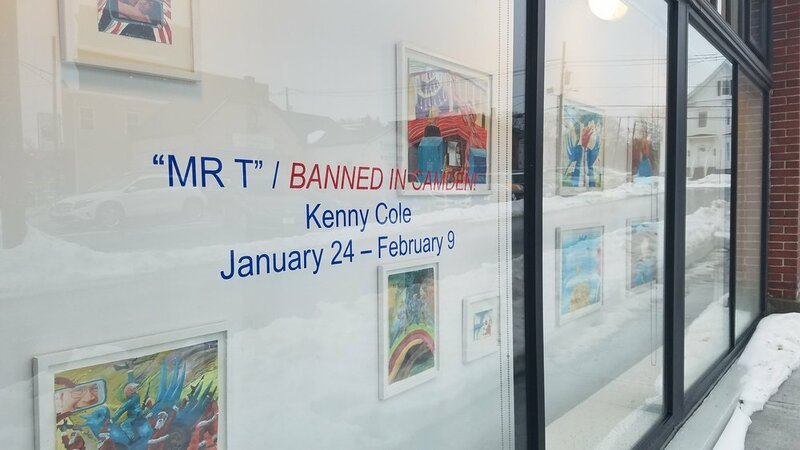 My work has been exhibited at the Center for Maine Contemporary Art and at the University of Maine Museum of Art, where it was acquired into their permanent collection in 2014. I was awarded a mid career Esther and Adolph Gottlieb Foundation Grant in 2017 and have been selected to appear in New American Paintings, No. 140, Northeast Issue in 2019. “MR. T” BANNED IN CAMDEN!